An apple a day may keeps doctors away, but eating kiwi fruit can certainly help you maintain healthy skin, reduce blood pressure and prevent stroke and other heart related disease. Kiwi fruit is counted among the most exotic fruits and it’s highly beneficial for your overall health and skin for its loaded with a number of nutrients, minerals, vitamins, antioxidants and dietary fiber. There are a number of benefits of eating kiwi fruit – Its aids in digestion, it’s good for vision and other eyes disease, good for cardiovascular health, improves the quality of skin and so on. Today in this post we are discussing about the major benefits of eating kiwi fruit and everything else worth knowing about this exotic power food. Kiwi fruit or the Chinese gooseberry has its origin in China and it is their national fruit. But the first commercial cultivation was started in New Zealand in early 20th century. People in New Zealand started calling it the kiwi fruit, because of its fuzzy appearance and resemblance with their national bird Kiwi. There are over 60 varieties of kiwifruit available in the market. The most popular and commonly available variety is known as Hayward which has a sweet and refreshing flavor. The best way to consume kiwifruit is to have it all alone, but it is also used for garnishing various types of salads and refreshing drinks. 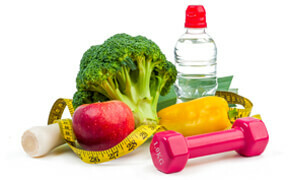 I am sure you know how important it is to eat fresh vegetables and fruits to maintain good health. But there are certain vegetables and fruits which are magical and kiwi is one such exotic fruit. You will be amazed to know that kiwi offers more vitamin C than oranges and not only the vitamin C, Kiwi contains a number of nutrients and antioxidants which are vital to maintain good health. From helping in maintaining good cardiovascular health to helping digest food, maintain healthy skin, and good vision and eye health; there are many other benefits of eating kiwi fruit. Listed below are the most commonly known and proven benefits of eating kiwi fruits. Kiwi fruit is called as the powerhouse of nutrients, vitamins, minerals and antioxidants because it contains nearly no fat, zero cholesterol and plenty of calories. By eating just about 100 grams of raw kiwi fruit, you get 61 calories and only 1g fat and zero cholesterol. Same portion of kiwi fruits will have about 312 mg of potassium, 3 mg sodium, 15 mg carbs, 3 grams of dietary fiber, 9g of sugar and 1 g of protein. It also contains 154% of daily need of Vitamin C, 38% of Vitamin K, 10% of daily recommended Vitamin E, 1% of vitamin A, 3% of calcium and 1% of iron. Because of the high contents of vitamin C, Vitamin and polyphenols, kiwi fruit is considered to be good to maintain good cardiovascular health. According to this study consumption of just two or three kiwi fruit can reduce the blood triglycerides by 15% and based on other key finding, the study concludes that eating kiwi fruit may improve heart health and prevent heart related issues. Proper digestion of food is essential for our good health and Kiwi fruit is known to aid in digestion of food. The kiwifruit contains a special enzyme named actinidain which is a protein dissolving enzyme. Because of the presence of actinidain, kiwi fruits help in digestion. Apart from actinidain, kiwi fruit also contains dietary fiber which is considered to be great for promoting bowel movement and digestion. Getting proper sound sleep is essential to remain healthy and look younger and studies suggest eating kiwi fruit may benefit getting better sleep. Kiwi fruit contains number of medicinal properties and compounds including antioxidants and serotonin which is considered to be beneficial in treating sleep disorders. The study was conducted on a group of 22 female and 2 males for four weeks. They ate 2 kiwi fruit one hour before going to the bed. They observed better sleep duration and quality. Consumption of kiwi fruit is known to be good for eyes for it contains lutein and zeaxanthin which is critical for good eye health. You can easily get rid of a number of eye disease including cataracts by eating a couple of kiwifruits every day. According to a study published by NCBI, Kiwifruit is rich source of vitamin C and contains a number of Phytochemicals which repairs DNA oxidation damages. The result of the study clearly suggests that the consumption of golden kiwifruit strengthens the resistance towards endogenous oxidative damage. Stronger immunity helps our body fight the most common diseases caused by pathogens. Immunity is basically the self defense mechanism of our body. Naturally, stronger immunity means fewer diseases. Thankfully fruits and vegetables high in vitamin C helps boost our immunity and Kiwi fruits contain a lot of it. 100 grams of fresh kiwi fruits may contain up to 154% of daily recommended dose of vitamin C.
Eating kiwi fruit is good for general health and well being, but did you know that it’s equally good for your skin? Kiwi fruits are high in Vitamin C and also contain Vitamin E which helps get beautiful skin and skin texture. It also helps fight common skin issues like wrinkles and skin damages caused by pollution and exposure to sun. I am sure you know have a better understanding of the benefits of eating kiwi fruit, but you may still have may question like how to eat the kiwi fruits and how many and so on. Eating kiwi fruits can be beneficial for most of us. Listed below are some of the other essential information and frequently asked questions about kiwi fruit. What is the best way to eat kiwifruits? We all know that there are many fruits which can be baked, grilled and cooked. We can even grind and make smoothies, but then different foods have different characteristics and it taste differently based on how you eat it. Kiwi fruits can definitely be used in cooking, but the best way to have kiwi fruits is raw. Wash it properly, slice or cut into cubes and eat it or use it with other raw fruits in fruit salad or as a dressing to your favorite fruit and drinks. How many kiwi fruit should you eat a day? Even if the kiwi fruits are considered to be very healthy and beneficial for humans, you should not have plenty of it at a time. Ideally two or three kiwi fruits should work well for your good health. By having a couple of good sized kiwi fruits can reduce the chances of blood clotting by up to 18 percent. Is kiwi fruit good for weight loss? Yes. 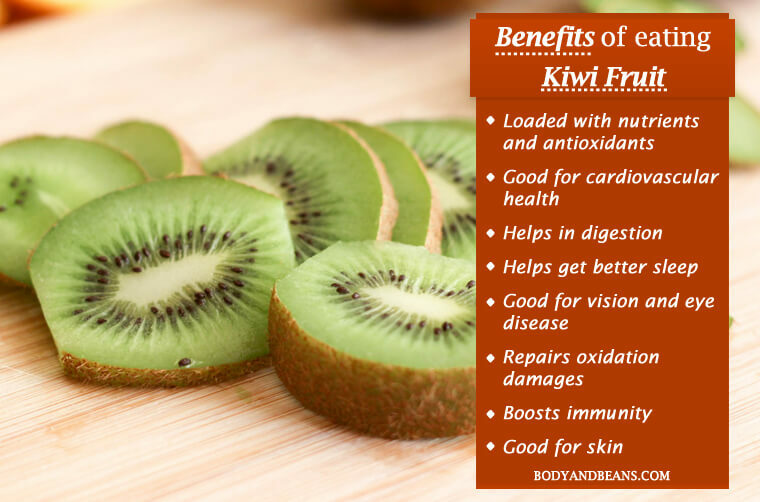 Kiwi fruits are seriously good for those who are looking to lose weight. As you know, kiwi fruits are the powerhouse of nutrition, low on calories, nil fat and nearly zero cholesterol. Kiwi fruits do not help in burning fat, but it helps you curb your appetite by keeping you fuller for long and thus help you lose weight. It’s one of the best fruit to have to lose weight. Do kiwi fruits help you sleep? Yes. Research suggests, that having a couple of kiwi fruits one hour before the bedtime can induce good sleep, both in terms of the quality of sleep and duration. Not at all! Kiwi fruits are in fact the best choice for those looking for good nutritious option that can help in weight loss. Kiwifruits are low on calories, low on fat and have no cholesterol and contains plenty of vitamin C, K and E and minerals like potassium and dietary fiber. These nutrients help protects against respiratory and digestion related disorders. Is Kiwi fruit good to have in pregnancy? Studies suggest that a pregnant woman requires about 400 to 800 mg of folic acid for healthy growth of the foetus. And kiwi fruit is good source of folic acid and hence it may be beneficial to have kiwifruit during pregnancy. But some of us may have allergy and they should avoid eating kiwi fruits. Kiwi fruits could also slow down blood clotting in rare cases and hence if you are to undergo some surgery, you should consult your doctor and get proper advice before eating kiwi fruits. Kiwifruits or the Chinese gooseberries are considered to be the most exotic foods. They are loaded with most of the vital nutrients, vitamins and minerals. From helping in weight loss, to cardiovascular health, respiratory illness, digestion related issues, eye sight and sleep disorders, eating a couple of kiwi fruits can immensely benefit your health. Kiwi fruits are widely available which can be consumed raw or can be baked, cooked, grilled or grinded to make smoothies. Do you eat kiwi fruits? What are the known benefits of kiwi fruits that you can vouch for?